5MHz 8mm TF-5C thickness meter probe. Mini-lemo connection. 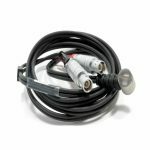 CD5-5 button probe 5MHz-5mm diameter with integral leads & lemo connectors. 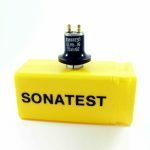 Sonatest 5MHz 10mm twin 0° probe. Subvis connection. 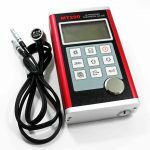 Ultrasonic thickness meter with 320×240 pixel, full colour, hi-res display. Snapshot A-Scan facility, dynamic colour change on alarm facility, echo-echo measurement for through paint and coating. 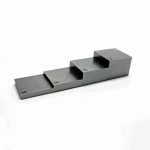 Supplied with standard probe (0.8-100mm with 0.01mm resolution), carry case and calibration certificate. Ultrasonic echo-echo through coating thickness meter. 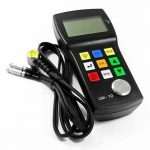 Supplied with standard probe (1-100mm with 0.1mm resolution), carry case and calibration certificate. 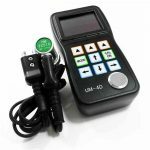 Ultrasonic thickness meter supplied with standard probe (1 – 100mm with 0.1mm resolution), carry case and calibration certificate. 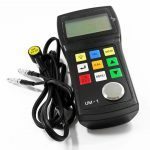 Ultrasonic thickness meter with rugged aluminum case and large LCD display. 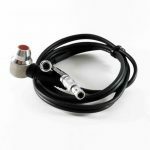 Supplied with 5MHz 10mm probe (1.2mm – 200mm with 0.01mm resolution), carry case and calibration certificate.